●What are the different lines at easyoga? ●What are the main materials in the clothing? ●How to wash our clothes? 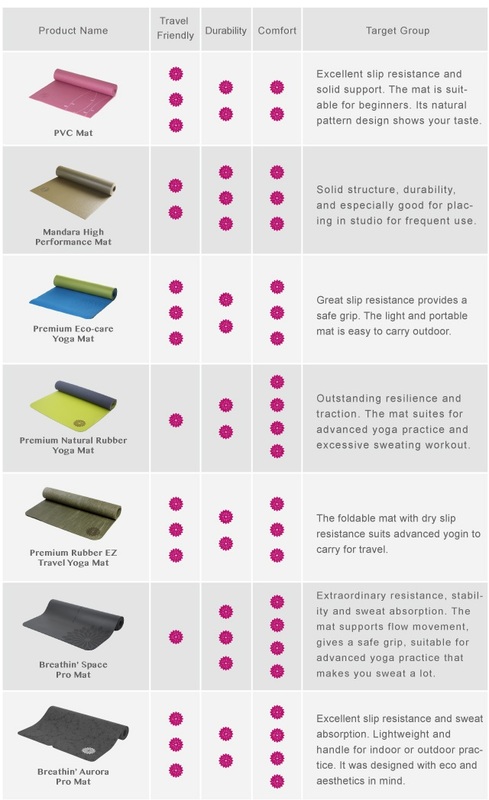 ●What are the features of different types of yoga mats? ●How to extend the lifetime of your yoga mat and how to clean it? ●How to take care of your yoga towel? What are the different lines at easyoga? What are the main materials in the clothing? For the most accurate information, please refer to the product information under each item photo. In general, easyoga employs the use of professional grade dry-fit, light-weight and high-shaping quality fabrics, which are capable of delivering both functionality and comfort. Also, cotton-like fabrics are extensively used at Bertii series to enhance a feeling of comfort. If you purchased a LA-VEDA top, it will include 2 bra pads. The bra pads are all identical sizes, but they are separated to fit on the left and right! Cleaning Method: Please use a mild detergent and handwash for the best results. How to wash our clothes? Because our clothing is made of the highest grade materials, it is important to use proper washing methods to ensure the longevity and integrity of the clothing.For specific details on how to maintain our items, please refer to the “Fabric Care Guide” page. What are the features of different types of yoga mats? The best mat for you will be comfortable and functional. The following table compares the important features of different types of easyoga yoga mats for you to easily choose which one is right for you. We recommend you take your yoga style into consideration as well. Upon first opening up your yoga mat's packaging, you may notice a slight odor, which is normal. Use a damp cloth with alcohol (1 part alcohol 3 parts water) to clean the mat, then place in a dry area with good ventilation for 3-7 days. This will help reduce the smell. Each individual mat has its own instructions, so please refer to these instructions for further details. How to extend the lifetime of your yoga mat and how to clean it? We recommend that you ALWAYS wipe your yoga mat with a damp cloth and then a dry cloth immediately after each use. Wait for the mat to dry before rolling it back up. This will not only ensure extended lifestyle, but will also make your practice more hygenic! Additionally, avoid sun exposure and high tempatures every time when use and store your mat. easyoga eco-care yoga mat could decompose after a certain period of time and PU mat has softer surface. To prevent mat surface from damage, please avoid wearing any hard or sharp accessories during practice. How to take care of your yoga towel? Yoga towels should be washed with like colors and a generic or mild detergent. The towels can be washed with other clothing items, but to ensure protection of the fabric and prevent snags, we suggest either using a delicate bag or washing seperately with other towels only.